The intent of this installment, will be to explore the penalties for Bank Fraud pursuant to USC Title 18: section 1344 … after reading this Installment Readers can determine the probability that any action will be taken on the OIG US DOJ referrals. Installment #8 concluded with a statement that the Series: NO WITNESS = NO CASE "will explore the issues that prompted the OIG of US DOJ to refer the DEFENDANT’s "Grievances" forward to US DOJ Criminal Division, the US Department of State, and the US Social Security Administration"…and so we shall begin here by introducing an email that DEFENDANT received via email dated August 21, 2009 from the DOJ/OIG Investigations Division. 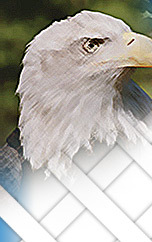 (Although the linked email involves several referrals; this installment will cover DEFENDANT’s complaints that appear to have been referred to the US DOJ Criminal Division with respect to, among others, the 1988 BankEast Line of Credit for the benefit of Business Assets Management Inc.[hereinafter BAM], and Senter Cove Development Company, Inc [herein after Senter] (both companies associated with the DEFENDANT). The other issues with respect to the other OIGs re: DEFENDANT’s stolen identity, which has caused her to be without a legal social security number, will be explored in upcoming installments). Some of these issues are in State’s REPORT, Sources of Information 6 (which is the DEFENDANT’s January 9, 2009 letter that appears to have prompted OIG US DOJ email referral). NOTE: If you are a new Reader of this series "NO WITNESS = NO CASE", you may want to begin with reading the eight prior installments before you read this one. The main objective of this Series of Installments is to lay out DEFENDANT’s rebuttal argument, and "Affirmative Defenses" to the State’s REPORT "Testimony" that was faxed to the Laconia District Court [LDC] in re: 09-cr-1293-4 and 09-cr-4147 minutes prior to the hearing on the merits of the May 15-16, 2009 arrests in re: 1293-94 (in both cases the DEFENDANT is charged with misdemeanor criminal trespass. In re: 1293-94 the misdemeanor was an "A" classification, which entitled her to a Public Defender attorney. In re: 4147 the charges were classified a "B" and therefore the DEFENDANT had to defend herself, pro se. The REPORT "Testimony" was also submitted to the court in re: 09-E-4147: the subsequent arrests of the DEFENDANT after the Belknap County Superior Court ORDER that GRANTED DEFENDANT’s MOTION for a Temporary Restraining Order against Waukewan Holdings, LLC. However, the REPORT then immediately characterized the above statement as just another example of DEFENDANT’s "paranoid delusional disorder" when it testified to the LDC that: "As another example, when she receives a response from an agency stating that they are closing the matter but will refer to another agency, she minimizes that they are closing the matter and instead focuses on the referral as an indication of affirmation of merit to her "case". She misses the social cue in favor or maintaining a deluded understanding." An issue at point would be the August 21, 2009 email. 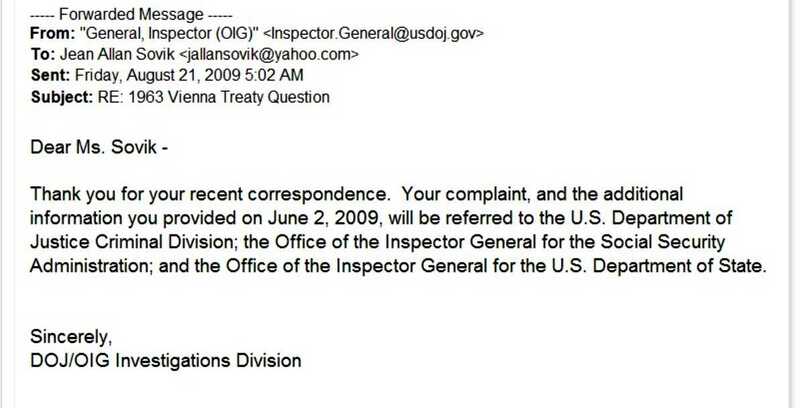 The text of the email from OIG USDOJ states: "Thank you for your recent correspondence. 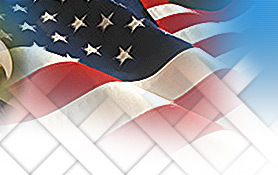 Your complaint and the additional information you provided on June 2, 2009, will be referred to the U.S. Department of Justice Criminal Division; the Office of the Inspector General of the Social Security Administration; and the Office of the Inspector General for the U.S. Department of State." How would the Readers interpret it? Assuming for argument’s sake, that DEFEDANT did have a ‘meritorious affirmative defense’ against the above cited arrests, and that the State, among others, were concerned that, in the State’s words: "A trial for her will involve attempting to get even more data to understand the alleged conspiracy better, with more investigation and unearthing of more details to prove the conspiratorial links still left uncompleted and/or which she had yet to convince a Court about thus far." For the rest of this installment, and upcoming ones, we will explore the potential that there is, in fact, a substantial downside for the State and any other parties in the "alleged conspiracy" against the DEFENDANT, and her family, and their persons, and property, if her "Affirmative Defenses" were to be found "meritorious". For a better understanding of just how high the "stakes" may be; Readers may be curious as to which applicable penalties (which are already on the law books) may apply in DEFENDANT’s case, if there were a political will to pursue the matter. USC Title 18: sec 1344 is one of those laws in the Federal arsenal that could be utilized to investigate the "principals" already named in the previous installments (and yet to be named). The body of evidence that supports DEFENDANT’s fact set can also be found in the plethora of pleadings in related civil matters that have also been posted on nhjustice.net Court section. If there were to be an investigation that targeted any of the "principals" named in this Series: "NO WITNESS=NO CASE", and they were indicted and ultimately convicted of violations of any of the applicable sections of USC Title 18, and/or USC Title 15; those "principals" could be required to pay very high monetary penalties, and in some instances, perhaps even be eligible for very long jail sentences. At the outset of this Series of Installments, the DEFENDANT stated her objective to be two fold: 1) Impeach the State’s REPORT "Testimony"; and, to lay out what she believed to be her "meritorious affirmative defenses" to the four misdemeanor arrest for criminal trespassing. The task is a daunting one. In re: Southmark v Coopers Lybrand (163 F3d 925 1999) the presiding Judge said it best: "Lurking like a troll beneath a bridge, procedural complexities bedevil a straight path to analysis of this case." The fact set in the entire High Birches Springs saga has been plagued by "procedural complexities" (or worse) that only lots and lots of money, power, and influence can buy. The legal jurisdictional maze that has been established by the ‘best and brightest’ attorneys for their elite clients can and has ‘bamboozled’ the best of the rest of US. And, for more than two decades the political will to treat due process rights of the average citizen in accordance with the rule of law (as blind lady justice requires) appears to have blocked "a straight path to analysis" of DEFENDANT’s ‘meritorious affirmative defenses’ as well. In its REPORT "Testimony" to LDC the State has willingly played the role of the "Troll hiding beneath the bridge". It had been difficult enough for the DEFENDANT to piece together the information that she provided to the OIGs of US DOJ, and SEC in her letter dated January 9, 2009 (Sources of Information 6). That communication appears to have been included in the August 21, 2009 referral to US DOJ Criminal Division as cited in OIG USDOJ email; but, instead of researching DEFENDANT’s supporting facts, the State’s "Testimony" dismissed them with the statement found in the bullet below. "The overarching thread that she maintains throughout her story, as described by her both during the current interview as well as in the documents she provided, is held together and supported by an intricate web of complex links including (but not limited to) mobsters, financial schemers, compromised lawyers and judges, compromised agencies at high level of NH and State government, incompetent or compromised engineers, fraudulent of deceptive loan agreements, sabotage, physical attacks, suspicious incidences, and stolen identity." If the State’s "Testimony" were to be believed (which is was when LDC made its ORDER of ‘not competent’), the State effectively "bedeviled" any chance that the LDC would have had to sort out the merits of the underlying issues. By denying DEFENDANT’s ability to be a ‘witness’ the State effectively granted immunity to all those "principals" incorporated, by class reference, into its above dismissal of DEFENDANT’s claims. Considering the information already put forth in the previous Installments with respect to the 1988 BankEast loan that have been laid out with some particularity; and, assuming for the time being that the facts laid out are true, then: What would be at risk, for the already named, and yet to be named "principals" if they were subjected to the scrutiny of investigators using USC Title 18: section 1344? And, what would be the incentive for the State of New Hampshire to play the role of the "Troll beneath the bridge"? Therefore, this installment will lay out the alleged predicate acts that would perhaps trigger the penalties that attach to Section:1344. The acts listed below would have been incorporated into DEFENDANT’s testimony to the LDC. But, instead as Readers now know, the State’s REPORT "Testimony" (which was allowed to be introduced with no rebuttal from the DEFENDANT in violation of her due process rights) short circuited that opportunity. As always, it is up to Readers to determine whether the State’s above conclusions are correct, or whether the penalties laid out below caused the State to willfully play the "Troll beneath the bridge", and "retaliate" against the DEFENDANT in order to ‘shut her up’. NO WITNESS = NO CASE. The major financial instrument of "Institutional Fraud", that was the focus of DEFENDANT’s "Affirmative Defenses", was the 1988 BankEast loan. This is the financial instrument that was used to foreclose on the real property owned by the JVFT, and located in Center Harbor, NH. And, it was in the kitchen of this property where the State arrested DEFENDANT on May 15, 2009. DMSB was of counsel to BankEast when it negotiated title insurance with First American Title Co [FATICO], during the underwriting process of the 1988 BankEast loan. DMSB was also corporate counsel for CLD the engineering firm that had a financial in BankEast securing title insurance. Brian Ray, attorney for FATICO made a Memo to the effect that he was instructed by DMSB to "paper over" the survey exception: Which he did, as instructed. Further investigation most likely would discover that DMSB knew, or had reason to know that a successful claim would be immediately made against the survey’s accuracy: Which there was, on August 26, 1988. DMSB represented both BankEast and Borrowers BAM and Senter at the closing of the 1988 BankEast loan. DMSB did not inform BAM or Senter of its instructions to FATICO. BAM and Senter paid DMSB to secure independent title insurance: Which it failed to do. No title insurance was ever issued to BAM and Senter by FATICO. DMSB, while representing Senter, negotiated the purchase of the 58 acre out parcel with the abutter who had made a valid claim in August 1988 against the CLD survey. The $400,000 purchase was closed on September 11, 1989. DMSB represented BankEast, BAM and Senter when it created and recorded a reconfirming mortgage to BankEast thus, eliminating the technical default claim that BankEast had made against BAM and Senter. It was not until June 2006 that BAM, Senter, DEFENDANT and JVFT found what had really happened on October 12, 1989. And, that was only after the Federal Judge in re: 06-cv-224-sm Ordered from the bench that McLane Law Office divulge where the BankEast v BAM, Senter et al case file was. The file was found in the Hillsborogh County Superior Court. The file revealed that the alleged authority of the Special Appearance afforded DMSB the authority to negotiate for (BAM, Senter and the DEFENDANT, but not the JVFT). And, with that power and authority, and without any notice or consent of BAM, Senter, DEFENDANT, or JFVT, DMSB agreed to modify the 1988 BankEast loan, and enhance it with additional collateral of an estimated value of over $1.5 million. The additional real properties were, in part, owned by the JVFT. BankEast was represented at the hearing by Attorney Dan Sklar. At no time do the files show that BankEast offered any consideration to the JVFT for its contribution. At no time did BankEast raise an objection with the court disclosing the actions of the other attorneys, as the court’s rules require. Shaheen & Gordon did not file an objection to the modification of the 1988 BankEast loan. Shaheen & Gordon did not inform their clients what had transpired on October 12, 1989. Shaheen & Gordon did not report their own acts to the Court. Shaheen & Gordon remained silent. In 1989, DMSB was on record with the Secretary of State, as acting Secretary of the JVFT. JVFT was a client of DMSB. On October 17, 1989 the alleged date when DMSB counsel created the BankEast naked mortgage documents (that had been incorporated as a material condition of the October 12, 1989 1988 BankEast loan modification agreement) DMSB never notified its client JVFT of its alleged contribution for no consideration to the modification agreement. DMSB did not notify its other clients BAM, Senter, or the DEFENDANT of the loan modification agreement. Therefore, when the BankEast naked mortgages were filed in Strafford and Belknap County Registry of Deeds, neither JVFT, nor BAM, Senter, or DEFENDANT had any knowledge of the recorded filings. DMSB attorneys did not supply JFVT, or BankEast borrowers with the recorded deeds, although they had a legal responsibility to do so. In August 1990, DMSB was already New Hampshire corporate counsel for one of the Gene Phillip companies, First Equity Insurance Co.
For simplification here, Readers should be aware that DMSB’s client First Equity at first offered to BAM $300,000 in cash to be held in escrow as liquidated damages in the event First Equity failed to close. Then, DMSB advised BAM that it would be better off exchanging the cash terms in the Purchase Agreement, for the acceptance of approximately $1 million dollars of a publicly traded stock. In this case the pledged stock shares would be in a company called Ecotech, which was rented by First Equity and held by it as capital surplus. At the time the switch was advised, there is credible public information that DMSB had knowledge that the Ecotech stock was a fraud: Which it later was proved to be. As a requirement of the closing for Senter stock, DMSB’s client First Equity demanded that all the creditors of Senter enter into loan modification agreements with Senter. A major condition of the loan modification was that the secured creditors (which included the 1988 BankEast loan) agreed to discharge their secured interests in mortgages, and, in exchange, Senter would provide substitute collateral to include, but not limited to: 1) prorated interests in the Ecotech stock, allegedly valued at $1 million; 2) prorated interests in Senter’s lawsuit against DMSB client CLD, the surveyors, among other ongoing suits that Senter owned naming the Danboise’s, the sellers of Senter stock to BAM. On February 5, 1991, while in Chapter 11 Bankruptcy BankEast agent Deborah Blondin signed what the bank purported to be the ‘one and only’ mortgage that it held, and that mortgage was the second lien securing the land in North Woodstock, NH. DMSB, while acting as attorney for First Equity, determined that BankEast’s mortgage discharge satisfied First Equity’s conditions. DMSB advised BAM to sign First Equity’s purchase offer. DMSB, while wearing the ‘hat’ of "her attorneys" advised BAM to agree to the 1991 Superseding BankEast loan modification. At no time during the 1991 loan modification negotiations was BAM, or the DEFENDANT informed of any other mortgages that BankEast may have of interest to DEFENDANT, or of interest to DMSB other client JVFT. Installments #5 and #8 describe with great particularity the actions taken by Attorney Daniel Sklar subsequent to BankEast’s failure on October 10, 1991. (Readers are strongly recommended to read those installments before continuing.) However, it is public knowledge that Attorney Dan Sklar represented BankEast in its Chapter 11 filing prior to its failure. Subsequent to BankEast’s failure, BONHAM purchased the failed bank’s non performing assets. BONHAM retained the legal services of Attorney Sklar to collect upon those non performing assets pursuant to BONHAM’s agreement with the FDIC. On May 2, 1994, the lawsuit that BAM, Senter, and the DEFENDANT brought against DMSB client CLD, the surveyors of the 120 acres of land in North Woodstock was to be settled with a cash payment to Plaintiffs BAM et al of $820,000 (Readers will recall the 1991 superseding creditor agreement provided BankEast, and or its successors, a portion of that proposed settlement.) Attorney Daniel Sklar was informed of the proposed closing date by the DEFENDANT. BONHAM did not appear, or file a claim as per BONHAM’s contract with the FDIC required it to do. However, as it has already been reported in previous Installments #5 and #8, in September, 1994 (several months later) BONHAM did file an Appearance in a Petition to Quiet Title to the High Birches Spring water rights that had been filed by Senter, and other related affiliate companies of the DEFENDANT. After filing its Appearance, BONHAM refused to produce its proof of "Standing" except to say that BONHAM had purchased the non performing assets of the failed BankEast. In 1995 DEFENDANT and affiliated companies filed a 93A civil RICO law suit against BONHAM and FDIC, Inc, among other defendants, in Suffolk County Superior Court in Boston, MA. BONHAM and FDIC, Inc filed Appearances and removed the matter to US District Court Massachusetts. Attorney Sklar, according to public records was still representing BONHAM, although he was not litigation counsel of record in the 93A civil RICO matter. During the discovery phase of the 93A civil RICO matter, (1995-6), FDIC made a claim against Senter that it had robbed Amoskeag Bank (one of the other 7 New Hampshire banks that failed in 1991) while it owned a real estate development project in Fremont, NH. FDIC, Inc. later found that their charges did not apply to DEFENDANT, but to the former owner of Senter, the Danboises. After years of mediation and arbitration, on September 9, 1997 the arbitrator signaled to the defendants that he was favoring DEFENDANT’s fact set in the matter in front of him. On September 12, 1997 DEFENDANT found that sometime the day before (September 11, 1997) the main production borehole for the High Birches Springs water supply, along with a number of nearby monitoring wells, had been sabotaged with a cocktail of chemical to include heavy metals and other known carcinogens. During the ongoing process of DEFENDANT’s 93A civil RICO matter, the JVFT had also filed a Petition to Quiet Title in Belknap Superior Court [97-E- 202] in re: the BankEast naked mortgage. FDIC, Inc. filed an Appearance in its capacity as receiver for BankEast. BONHAM had been dissolved in December, 1995, and all the unsold, or unresolved non performing assets, which FDIC now claimed included the alleged Center Harbor naked mortgage were given back to FDIC. As already reported in Installment #8, the Petition was dismissed due to lack of subject matter jurisdiction. Also reported in Installment #8 in the Nolan Affidavit, FDIC attorneys’ coached their FDIC employee witness to lie: Which he appears to have done. In 2000, The DEFENDANT, after discovering some new evidence, brought another Petition to Quiet Title to the BankEast naked mortgage that allegedly secured the Center Harbor property, back into Belknap Superior Court. This time a company named RFS, Inc. filed an Appearance using out of state counsel from New Orleans, Louisana. Soon after the Appearance was filed, the party defaulted. Judge Smukler Order a default judgment in favor of DEFENDANT. Just prior to the completion of 30 day waiting period, another company Regional Financial Services, LP [RFS, LP], also from New Orleans, Louisiana, by and through their attorneys, The McLane Law Office, made a claim against the BankEast naked mortgage that allegedly secured the Center Harbor real property. Their proof of "Standing" was that they were partners with the Resolution Trust Company [RTC] (which had also been dissolved in December 1995). This time, somehow, although RTC was not a receiver of BankEast, RFS, LP in some type of ‘dipsy doddle’ transfer, RFS/RTC partnership purchased the rights to the BankEast naked mortgage. RFS, LP now defined their claim as the "1989 Judgment". And, pleaded to the Court that the 1989 Judgment secured the Center Harbor real property. Judge Smukler, after sparring, from the bench, with McLane attorney Rouvalis, Ordered that RFS, LP in fact was the mortgagee of the Center Harbor naked mortgage. From that date forward, McLane Law Office made numerous claims to ‘collect upon a debt’, for a variety of clients, who now all appear to have been ‘connected’ in one way or the other to DMSB client Mr. Gene Phillips. In May 2005, one of those ‘connected’ parties (SN Servicing Corporation, Inc. and Ingomar, LP etal) filed a Petition in Belknap Superior Court to foreclose on the BankEast naked mortgage. The Petition was granted based, in part, upon an August, 2005 letter of submission by the McLane Law Office that attached several Affidavits of Proof of chain of title ownership filed by SN Servicing employee, Victor Parisi (uber robo signer). JVFT filed an Appeal. The Appeal was denied. In June 2006, in a last ditch effort to save the last real property owned by the JVFT, in New Hampshire, the beneficiaries of the JVFT filed a civil lawsuit. [06-cv-224-sm] It was during the hearing in that matter that DEFENDANT was able to learn (as already recounted above) the facts surrounding the creation of the BankEast naked mortgage in October 12, 1989. Armed with the newly discovered facts, JVFT filed a Motion with the Belknap Superior Court to Reopen the Petition to Foreclose [05-E-0078]. The Motion was Denied. The Appeal was Denied. On September 27, 2007 SN Commercial, a Robin Arkely II a "connected" "principal" foreclosed on the BankEast naked mortgage. The highest bidder at the auction was Waukewan Holdings, LLC. On May 15, 2009 DEFENDANT was arrested in the kitchen of the Center Harbor real property. The charge was Misdemeanor A criminal trespassing. And, the fine is for those principals is: "not more than $1,000,000 or imprisoned not more than 30 years, or both"
Talk about "complexities"! Assuming that the above fact set is true, this bank fraud spans two decades! Beginning in the late 80’s! The Readers will recall that at the same time BankEast failed 7 other New Hampshire banks failed. In the aftermath of what has now become to be called the "S&L Crisis", dating back to the late 80’s and early 90’s, several books have attempted to get to the "alpha and omega’ of the schemes. One of the relatively recent books on the subject has been authored by William Black, one of the S&L Crisis regulators who were given the mandate to sort out just what went wrong back then. His book is titled "The Best Way to Rob a Bank Is to Own One: How Corporate Executives and Politicians Looted the S&L Industry" .To paraphrase Mr. Black, ‘if you look for fraud, you will find it’. Giving credit where credit is due, back in those days, the regulators appeared to be aggressively looking. But, as DEFEDANT’s argument laid out above discloses, some those "principals" just kept on going! As recently as September 14, 2011 Statewide Bank, Covington LA, a Robin Arkley II et al bank, failed. The FDIC began a probe of the failure. Another comprehensive book on the S&L Crisis was written by a group of investigative reporters. It is titled: "Inside Job: The Looting of America's Savings & Loans" (and certain banks). One of the companies that the "Inside Job" investigators began to develop information on was a company named Southmark. (Yes, one and the same Southmark from the above cited Judge’s "Troll" quote). But, before fully developing their information the investigators were scared off. Why? One claim was that the "principals" in Southmark, were too big to fail. One of those "principals" was Mr. Gene Phillips the DMSB client and owner of First Equity Insurance. So, two decades later the DEFENDANT is faced with the daunting task of defending against "principals" who were "too big to fail" two decades ago, and appear to be more "Teflon" coated today than way back then. And, if this is true, then certainly all those "connected" are also "to big to jail". The links above would suggest to any reasonable Readers that Mr. Gene Phillips and Mr. Robin Arkley II share the same "to big to" cloak. And, unfortunately for the DEFENDANT both are main "principals" in DEFENDANT’s fact set. The DEFENDANT did not choose to associate with them. They chose to target the DEFENDANT’s property: The High Birches Springs. So although, many of the "principals" in the DEFENDANT’s affirmative defense case should be subjected to scrutiny of USC Title 18, there is no confidence among DEFENDANT’s supporters that this will ever come to pass. To Big to Fail = To Big to Jail. And, until that equation is changed, average citizens like the DEFENDANT, will have to wear the cloak that it has been assigned. In the DEFENDANT’s situation: Her assigned cloak is one of a "nutter" without legal US identity, and without the ability to collect upon her well earned social security benefits. Not a happy place to be, and there is no relief in sight. Installment #10 – will continue to explore USC Title 18 RICO ACT and USC Title 18 Hobbs Act violations….. and, other issues that relate to the OIG US DOJ’s referral as stated in its email dated August 21, 2009.